Onomichi is a city in Hiroshima prefecture which is located in western Japan. Onomichi is very accessible taking about 4 hours to reach from Tokyo by bullet train (Shinkansen), and 1 hour and 40 minutes from Kyoto. Onomichi is the starting point of Shimanami Sea Route which is famous for cycling. The world heritage sites including the Atomic Bomb Dome, Itsukushima Shrine on Miyajima Island, Iwami Ginzan Silver Mine, and Himeji Castle are all neighboring sightseeing spots. 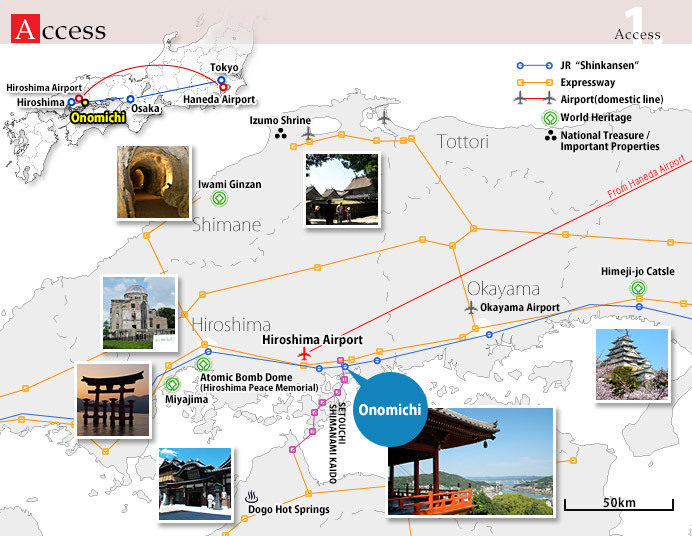 Traveling to Onomichi by bullet train (Shinkansen) is very convenient to visit the city. Since only the "Kodama Bullet Train" stops at the Shin Onomichi Station, please transfer from a "Super Express Bullet Train" to "Kodama Bullet Train" at Fukuyama Station, Okayama Station or Hiroshima Station.